There is no shortage of tough issues: whether it is collaboration between professionals, external oriented government, sustainable economy or development cooperation. They are characterized by complexity of different kinds: many factors and many actors are involved. It makes tough issues hard to pin down and impossible to eradicate. The dominant change repertoires are ill equipped for tough issues: clear division of tasks and responsibilities, minimizing conflicts, drawing up organizational missions, rolling out large-scale change programs, starting the change from the top or institutionalizing successful innovations. Such repertoires lose sight completely of the complexity that is at the heart of the problems. Tough issues can much better be dealt with by repertoires that match the complexity of these issues. Think of: forming teams around each issue regardless departmental boundaries, seeking diversity in contributions and ideas, knowledge intensive pragmatism, intertwining learning in and around work, accumulating ‘small wins’ into substantial change and organic diffusion of innovation. Part and parcel of innovating around tough issues is the need to work simultaneously on two fronts. It is inevitable that innovative approaches will be met with reactions like ‘I don’t see how this would work (around here)’. For this reason it does not suffice to use innovative repertoire. It is also necessary to reduce fixations in order to enlarge the space to try something different. For this reason the book describes twelve innovative mechanisms that show you how to intervene effectively as well as twelve stagnating mechanism that help you reveal what stands in the way. The book is written for change agents that (want to) take on more complex issues, regardless their position. It supplies action perspectives that can be used to deal with them more effectively and get other on board in doing so. The book contains many case examples that illustrate what this looks like in real life. It also gives access to theoretical notions that help understand the change dynamics and allow for further study. It does not allow to ‘manage’ the complexity out of issues. But it makes it possible to handle them well and enjoy doing so. This is good news, because many of such complex issues are found at the heart of organizations or communities and potentially add most value to the outside world. This book will be of interest to academics who do research on organizational transformation. It is based on six years of action research on the dynamics in dozens of multi year change processes dealing with tough issues that the author dealt with as experienced practitioner. The lessons learned are made available for their critical reflection. The ideas draw on different academic disciplines and might suggest interesting cross-fertilization. The original dissertation received honors. It was shortlisted as the best PhD research by the Dutch Society for Political Science and rewarded as the best PhD research by the Dutch Network of Quality Management. The book was shortlisted as best management of the year by the publishing sector and received an award for best book by the Dutch Professional Association of Management Consultants. 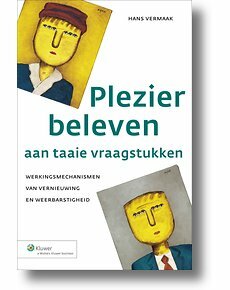 To book – now in its second edition – is only available in Dutch. To give English readers a ‘taste’, the original summary is made available here. It gives an overview of the findings.